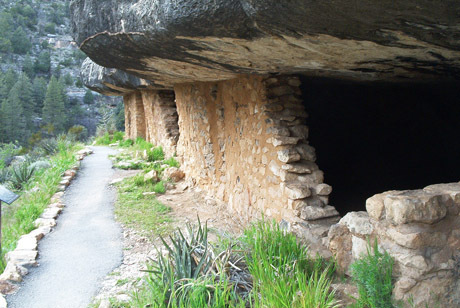 Sinagua cliff dwellings in Walnut Canyon National Monument. Photo Credit: 2002-2009 Dream Flagstaff Vacation and Hotel Guide; used under the Creative Commons license. The Sinagua were a resilient, resourceful, and culturally diverse people who inhabited the forests, canyons, grasslands, and deserts of central and northern Arizona from about A.D. 600 through A.D. 1450. The Sinagua created a unique cultural pattern during the more than eight centuries of their existence, adapting in particular to the eruption of the Sunset Crater volcano around A.D. 1064. Prior to the eruption of Sunset, the Sinagua people maintained rather low population densities, living in the high-elevation parks and woodlands of the North Country and farming maize, beans, and squash. Following the eruption, however, the Sinagua experienced mass population growth, especially in the areas east and north of Flagstaff, and great cultural changes, including the adoption of new farming strategies, new architecture, and intensified exchange and interaction with the Hohokam to the south. Perhaps the most remarkable time in all of Sinagua prehistory is the Elden phase, between A.D. 1150 and A.D. 1220, the peak period of northern Sinagua cultural expression. Hallmarks of this period include large pueblos, including Wupatki Pueblo, which consisted of about 100 rooms, extensive communities of smaller pueblos, increased exchange, increased social stratification and inter-community alliances, and ultimately, violent conflict. By the mid 1200s, much of the North Country was depopulated, perhaps as a result of decreased precipitation on ongoing conflict, and by A.D. 1275, most residents of the northern Sinagua settlements had migrated elsewhere, first to Anderson Mesa east of Flagstaff, and then north. In the Verde Valley, a larger number of settlement remained, including Tuzigoot, but by A.D. 1450, the Verde Valley pueblos were abandoned, as was Anderson Mesa. Visit Wupatki National Monument, Montezuma Castle National Monument, and Tuzigoot National Monument to see Sinagua artifacts and archaeological sites.